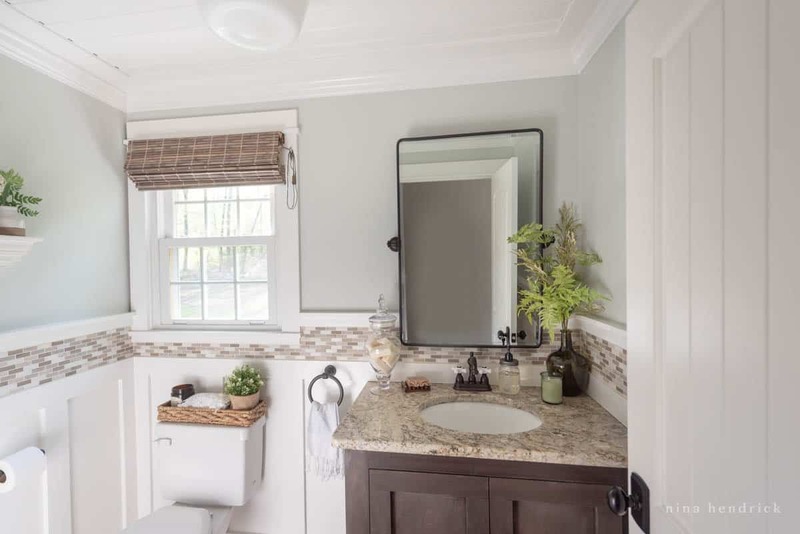 A dark and dated half-bathroom gets a fresh and clean upgrade with board and batten and a custom vanity. We replaced the tile floor, added a board and batten treatment (painted BM Simply White with the paint sprayer), with a tile border. The walls are painted Benjamin Moore’s Wickham Gray, which I love. Depending on the light it can be gray, blue, or green- which is so nice! 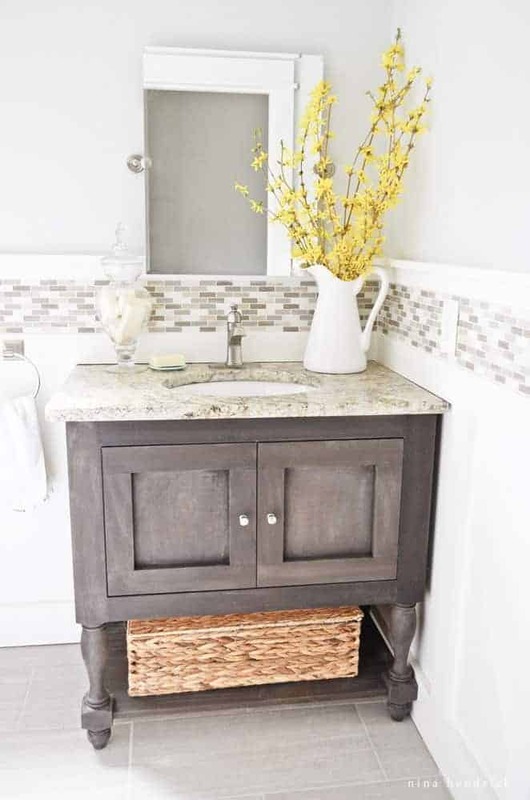 We built a knock-off of the Pottery Barn Newport Console and recycled the existing granite countertop. I found the basket (almost the same dimensions of the Newport Basket, but 1/4 the price!) last week at Homegoods. This beautiful painting provided inspiration for the whole room. 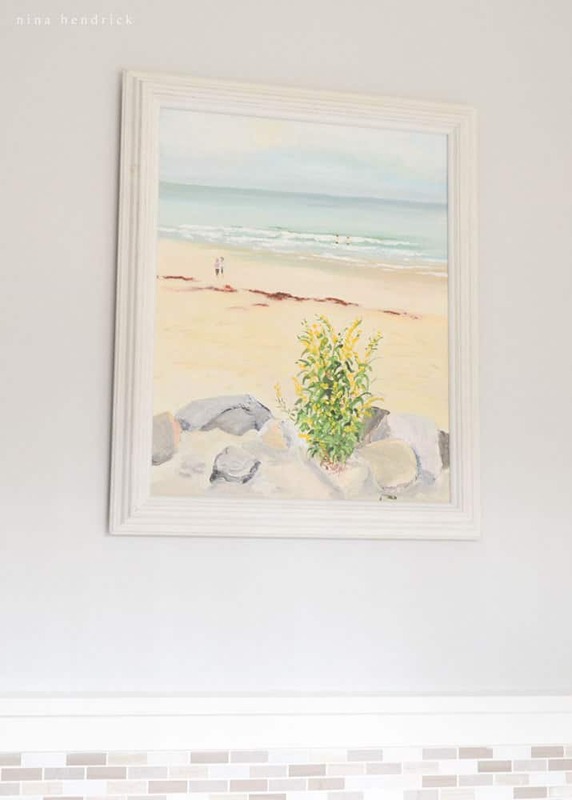 It was done by my grandfather of the beach in Ogunquit, Maine that he and my Gramma used to bring us to when we were little. I absolutely love Ogunquit, and our beach trips were such fun memories. I also happen to love the soft colors of this painting, so I tried to carry them out through the room without making it too coastal. I have many of my grandfather’s paintings throughout our home. Another view of the vanity. I learned the challenges of photographing a very small room during this project. The room measures 5’x7′. You can read about the building of the vanity here! This crown molding ledge was one of the ones from our breakfast nook that was displaced by our DIY crown molding shelves. I love it here! I used items I had on hand to decorate it, but I am on the hunt for some colorful antique bottles. 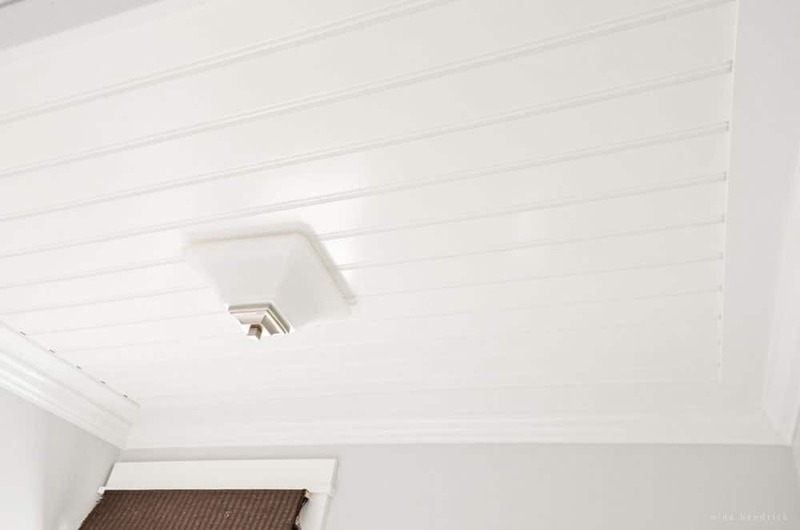 This is our beadboard ceiling treatment. This room had the same seashell plaster textured ceiling that the rest of the house has. I’ve mentioned before that it absorbs a lot of light and never looks quite clean. This beadboard ceiling solved this issue in this particular room, and we love how reflective it is! 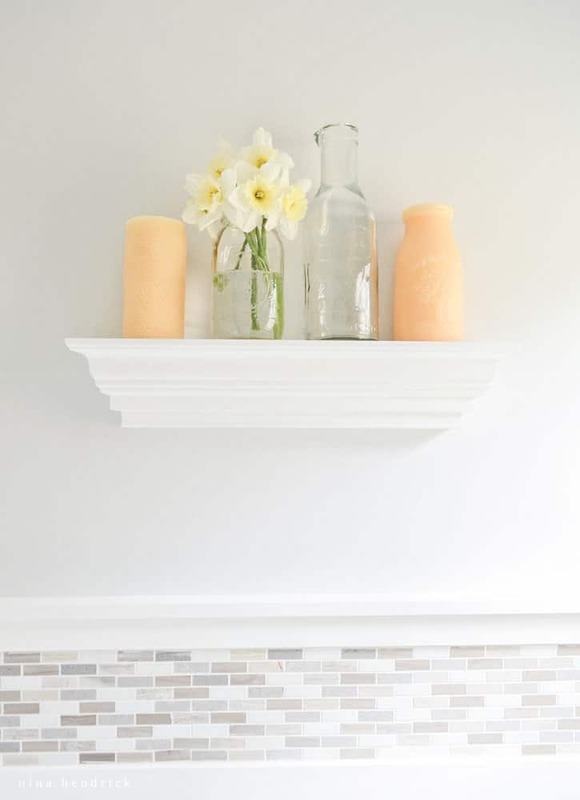 We aren’t sure that we will be doing beadboard in every room, although I think it works well for the bathrooms (I’m thinking white planked ceilings in the larger rooms.) You can read a how-to on how we made this ceiling here! 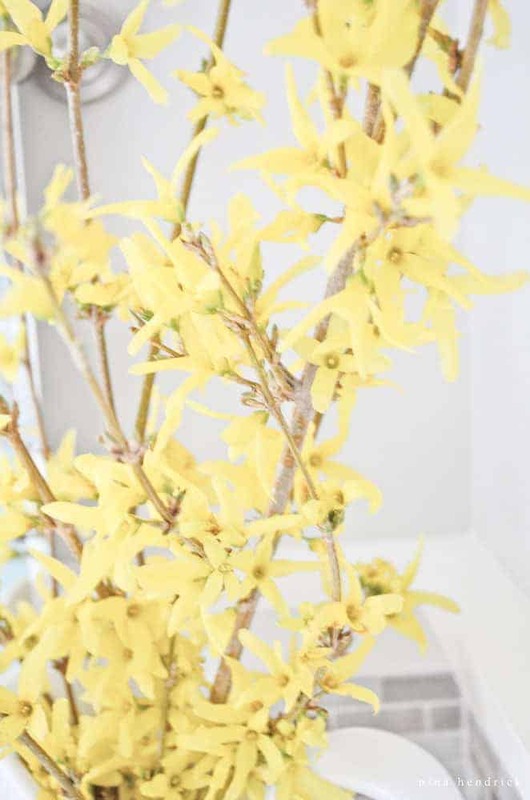 It was a lucky happenstance that the forsythia in our yard started to bloom just as I needed fresh flowers for these photos. I think it looks perfect in this room! This was exactly what I imagined, and I love seeing it pulled together. Who would have thought that my new favorite room would be the smallest in our home? Of course, I say that every time we complete a project. Believe it or not, we’ve already got a few new projects in the works! I will be sharing the rest of the tutorials for this project this week, and then I will be sharing some inspiration for the other projects we’ve been talking about! Wow! This room looks stunning after the redo. She said Benjamin Moore Wickham Gray. Amazing redo! Love the changes you made and what a difference it makes! Really great job, Nina! I love that you built the vanity and reused the top – so gratifying, isn’t it? The bathroom looks fabulous and you should be proud! I plan on using this in my powder room. I’d love to see how you managed the ceiling. I am loving this! You did a great job, this room has a really classy and timeless look to it. I love the splash of color with the yellow flowers, too. Very cute! Absolutely gorgeous makeover! 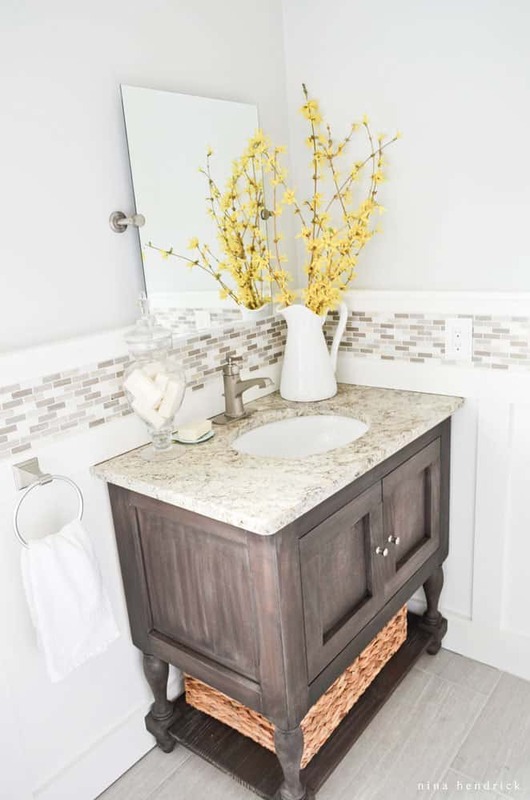 I love all your choices of tile, colors, and fixtures! Fabulous job! Thanks for linking up to Inspire Me Monday! Absolutely love every thing about this makeover Nina! Pinning. Love, love, love with a capital L. :) Can I ask where you got the tile? That is the perfect pattern/color for a flip house I am getting ready to start renovating. Thanks for sharing and linking up at The Scoop Link Party. Hi Barb! Thank you :) The tile is from Home Depot- It’s called Arctic Storm. It’s made from honed marble so it has a really nice matte texture in person. They also carried it in store, so that was perfect. Hope that helps!! absolutely gorgeous! the tile is my fave! What a change! It’s beautiful. Love the soft yet powerful color choices. And the vanity is amazing! This is such a gorgeous transformation! I’ve been trying to figure out what to do with our 1/2 bath (the smallest room in our house too), and I think you’ve given me some great ideas. I love how you put the tiles in the board and batten. So pretty! LOVE! What a stunning makeover! I love the board and batten and the mosaic tile used. I have been wanting to do this in my powder bath for a while. Yours is very beautiful! That ceiling is dreamy! lol I have not done a lot of molding / trim work, but after seeing your bathroom, I sure want to. :D Fantastic job! Nina, your bathroom looks amazing! We used a similar floor tile in our bathrooms and I love it! I did our powder room floor myself too :) Those 12×24 tiles are no joke to install! 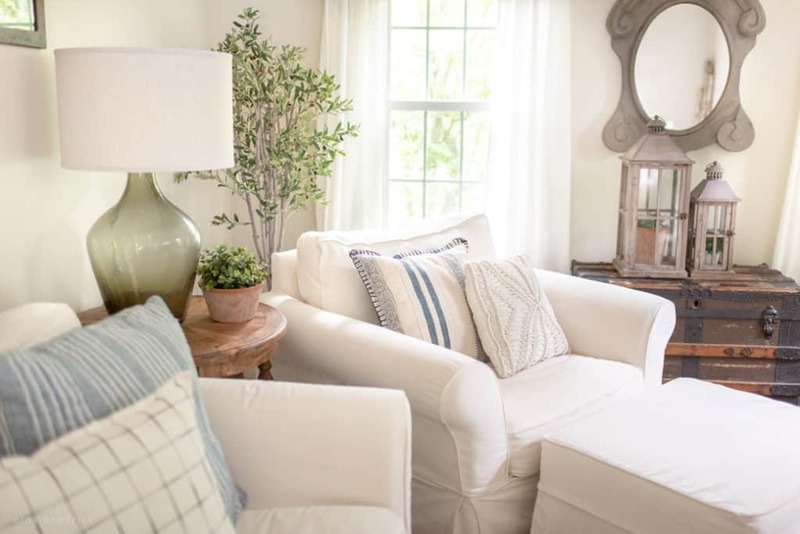 I also really love the Benjamin Moore Wickham Gray in here and would love to feature this on my paint color blog, Involving Color. Let me know if you’re interested! Hi Jena! I would absolutely love to be featured on your blog, thank you so much! :) And yes, those floor tiles were something- I figured it would be easier with the larger tiles- apparently not! I just came across your blog tonight and I love your powder room makeover! Especially the pottery barn vanity you built. Will you be doing a tutorial on it in the near future? I also love the finish on it and would love to know how to achieve that myself! I’m now a subscriber to your blog! Hi Tami! Welcome!! So excited to have you as a new reader :) My very next post will be about the vanity- either this evening or tomorrow! I love your DIY powder room makeover. Can’t wait to see how you built the vanity. So lovely and well done. Congrautations. I love this!!! 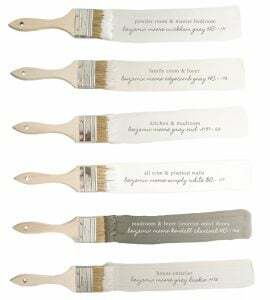 This is right up my ally :) Would you mind sharing what color of paint you used on the walls? Thanks! 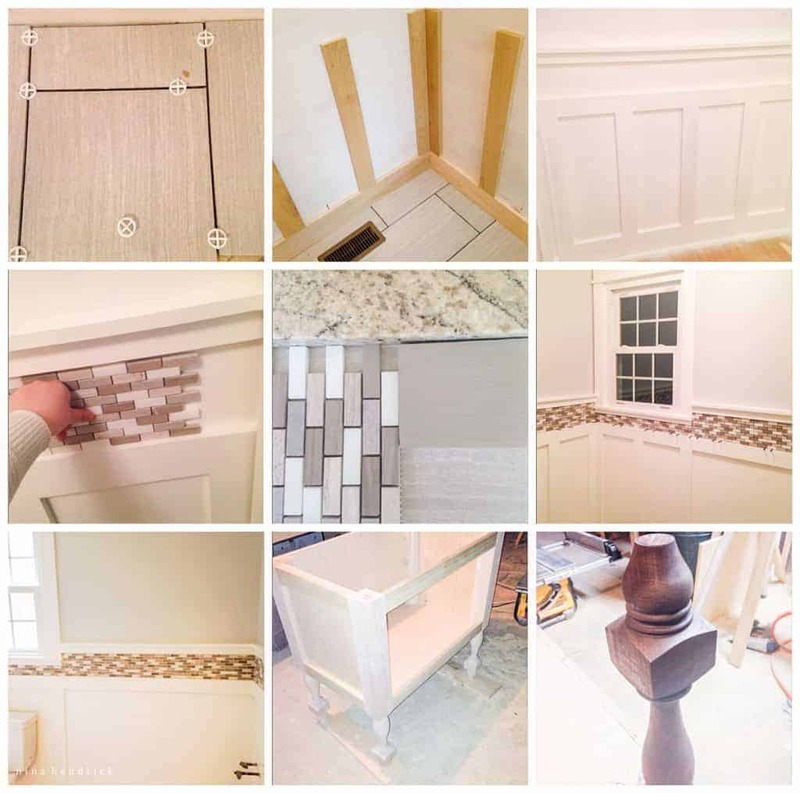 Can you PLEASE do a tutorial on how you did the Board and Batten with the tile trim and the wood border I loved your powder room makeover and want to be able to re-do ours! We already have the floor tiles & paint! I cannot get onto instagram..just an old fashioned person, w/o a smart phone (imagine that! )who’d REALLY like to be able to read/see a how-to on your site!! I would love a tutorial on the B and B too! I am getting ready to begin our Powder room and need some tips on the size board you used! I am doing this exact layout with a different vanity! Love love love this! Please help! W O W !!! that is incredible and soooo inviting! your beautiful instructions and tips! This looks great! I’d love to do the same in my powder room! Can you tell me what kind of wood you used for the board and batten? Is it hardboard mdf or plywood? What thickness was it? One of the things I’m trying to figure out is how thick the wood should be so that the mosaic strip won’t stick out further than the wood. Thanks! I may have missed it somewhere, but you pulled out the baseboard heaters, (always good riddance to those), but what are you using to heat the bathroom? When we redid our bathroom here in Montana we put on warmwire for heated floors, and I love it, can’t wait until we redo out kitchen and install the warmwire there, too. Our furnace quit on us, so we took the opportunity to install forced hot air! It was a big project, but now we have more consistent heating AND cooling. Best decision ever! What tile did you put on the floor? I am sorry if I missed you talking about it already. Thanks!